Forgot to pay your student loans because they didn’t seem “too” important? Neglected your medical bills because they were overwhelmingly high, and you thought that they didn’t affect your credit score? Or, did you use your credit card irresponsibly for half of your life? Whatever the reason is, your credit is suffering from your financial mistakes. The good news is you’re acknowledging that your credit is bad. One of your first steps to fixing it after paying off bad debt that hasn’t already fallen past the statute of limitations is by getting a credit card. Credit cards are immensely helpful when you’re trying to rebuild your credit. You just need to know how to use them and what your options are. So, before you start applying to any credit card you think will help, let’s talk about the different types. What are the types of credit cards? If you had a credit card before, you may have quickly picked one from your bank and went on with your life. In reality, a wide range of offers featuring a slew of different interest rates and terms are out there on the market. Besides choosing one based on the different banks making offers, credits cards can also be broken down by whether they’re secured or unsecured. A secured credit card is for people who are trying to build or rebuild their credit. When you apply, you’re almost guaranteed approval, but you also have to place a security deposit on it. Your deposit isn’t gone forever, though; when you close the account, you get your deposit back. The deposit you place on the card is your credit limit. This may seem unfair, but the credit lenders are ensuring their financial safety in the event that you don’t pay your bill on time. If you plan on depending on your deposit to cover your bill, don’t. Secured credit cards still incur interest monthly. In fact, it’s higher than unsecured credit cards. So, spend within your means and you’ll see your credit score gradually increase. Most cards require a minimum deposit of $200, which means your credit limit will be $200. If you can afford to put more down and know that you’ll pay your balance in full every month, then do it. Another thing to note is if you pay your bill on time for months, then you’ll be able to increase your credit limit. Just remember your goal is to spend responsibly so that you can upgrade to an unsecured credit card. An unsecured credit card doesn’t require a deposit and is meant for people with good or excellent credit. The best-unsecured credit cards, such as the Chase Sapphire or Capital One Venture, will give you amazing rewards. These kinds of cards are what you want to eventually work toward. While you can apply for one starting out, it’s generally not a good idea because if you’re denied it places a hard inquiry on your credit score. Secured credit card lenders receive collateral through your deposit; and since unsecured credit card lenders don’t, the fees are higher. Even if you were to pay your bill in full every month, some fees just can’t be avoided. So, your best bet is to get a secured credit card. 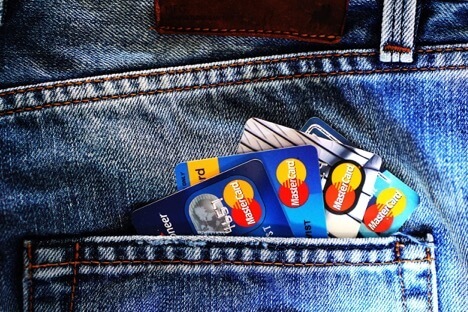 Now that we’ve covered the types of credit cards and established that secured credit cards are more friendly to people with bad credit, let’s look at some of the best-secured credit cards around. Although secured credit cards are best for bad credit, that doesn’t mean you should pick the first one you see. Not every secured credit card may be the perfect fit for you. Be careful to take the proper time and consideration before making your choice. The Capital One Secured Mastercard is a no annual fee credit card. Depending on your creditworthiness, you might have to pay as little as $49 to receive your $200 credit limit. If you pay your balance every month in full, you’ll be able to request a higher credit limit. The APR is 24.99%. The interest on this card is high, so you’ll want to avoid it by paying your bill responsibly. This credit card is not for you if your low credit score is the result of a bankruptcy. The Discover It Secured is a no annual fee credit card that also offers cash back. You can earn 2% cash back on purchases at restaurants and gas stations on the first $1,000 spent every quarter. You also get an unlimited 1% cash back on all other purchases. At the end of the year, you’ll get a dollar to dollar match on all cash back you’ve earned. If you’ve been paying your bills on time for eight months, then Discover will review your account and consider you for an upgrade to their unsecured card. The APR is 24.74% with a minimum $200 deposit and credit limit. This card gives you the opportunity to rebuild your credit while giving you the perks (like points and miles) found on unsecured credit cards. The OpenSky Secured Visa is a no credit check card. So, even if your credit is severely damaged, you’ll be able to work on it. However, you’ll be paying a $35 annual fee. The APR is 18.89% with a minimum deposit of $200. Another thing to consider is you won’t be able to upgrade to an unsecured card. Once you’re done with it, you’ll have to close the account and apply for a separate unsecured card. Overall, this card is good for those who are struggling to get a secured card from a traditional bank. We’ve covered some of the best credit cards for rebuilding credit, now let’s talk about some of the worst ones. Some credit cards are geared towards people with bad credit, but the risk you have to take just to repair your credit is taken to the next level. Companies that offer these cards have significantly increased the interest rates and packed them full of unnecessary fees. Here are the top three credit cards to stay far away from. The First Premier Bank credit card has a 36% APR. But that’s not all. The processing fee is $95. The credit limits are $300, $400, and $500. As your credit limit increases, so does your annual fee, which can get as high as $125 after the first year. While you won’t have a monthly maintenance fee the first year, the second year you’ll have to pay a minimum of $6.25 per month. It says it gives people a second chance, but this card isn’t worth its rates and fees. The Total Visa credit card has a 29.99% APR. Before you get to use your credit, you’ll have to pay an $89 processing fee. Your initial credit limit will be $300, but after fees are taken out, you’ll have $225 to spend. The annual fee is $75 for the first year, which decreases to $48 the second. Like the First Premier credit card, you’ll have to pay $6.25 per month for monthly maintenance. The Credit One Bank Visa Platinum credit card has a 17.49% to 25.49% APR based on creditworthiness. The possible credit limit you can receive is between $300 and $1,500. Depending on what you get, you’ll have to pay an annual fee of $0 to $75 for the first year and $0 to $99 for the second year. Also, you might be eligible for a 1.0% cash back on certain purchases also depending on your creditworthiness. While this card isn’t as terrible as the others, you’ll be walking into an agreement that guarantees only complete unpredictability in the APR you’ll be paying. While a credit card can help you rebuild your credit, it can’t help with the debt that you’re already drowning in. Your next step is to choose a debt relief program. Most reputable debt relief programs have multiple programs to choose from that fits your personal needs, while helping you get the lowest monthly payments. Kelly Berry is a blogger at JohnnyJet.com, a travel advice blog filled with plenty of personal experience travel destination stories, and tips and tricks for saving money while traveling all over the world. She has plenty of first-hand knowledge and appreciation for what it feels like to recover from poor credit and enjoys writing about valuable lessons.